The ABU Garcia 7000i SYNCHRO. What a line counter reel for Great Lakes Trout and Salmon Fishing! Finally…, a line counter reel specifically designed for Great Lakes trout and salmon trolling. I’ve been fishing the ABU Garcia 7000i Synchro line counter reel for several weeks now and all I can say is…, NICE! 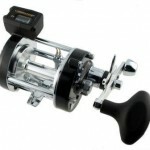 The 7000 has always been a great reel, popular with Great Lakes charter captains especially. But, now Abu Garcia has taken this classic trout and salmon reel several steps further. ABU Garcia has added a line counter and Penn Reel’s famous, silk-smooth HT100 drag washers to their Carbon Matrix drag system. The reel handle knob is super comfortable. But, the best part is the Synchro system, a feature that every Great Lakes troller will appreciate when trolling riggers deep for trout and salmon, Fishing mono, braided, or wire Dipsy rods, or using thumper(wire) rods off the stern of the boat. No more flipping the free spool lever and thumbing a reel or changing the setting on the star or lever drag to lower your downrigger into the depths. No more wearing the skin off your thumb as you drop a Dipsy back on wire. If you want to drop a rigger, let out a Dipsy, or lower a 1 lb. 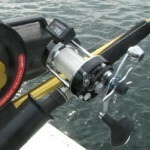 “meatball” into the depths, you never have to take your hand off the reel handle or change the drag setting. All you do is crank the reel handle backward a ¼ of a turn and the drag automatically loosens up slightly, maintaining enough tension to keep a bend in a downrigger rod as a rigger weight drops or allow a Dipsy to drop back slowly. I absolutely love the Synchro feature of this reel and everything else about it for the lake trout and salmon fishing my crews have been doing in late May. What a time saver the Synchro system is! Now, when I’m dropping a rigger to 140 feet for lakers, which takes a while, I no longer have to “stand at attention” with a reel in free spool and thumb the spool until the rigger reaches the right depth. All I do is crank the 7000i’s handle back a ¼ of a turn, walk away, listen for the beep on my Penn rigger signaling the rigger has stopped 140’ down, return to the rigger and crank the Synchro handle forward ¼ of a turn to the original drag setting and I’m good to go. Meanwhile, I can be netting fish, setting another rod or whatever. What a reel!!! The only thing I don’t know after fishing this reel for only three weeks is how it will hold up, and I’ll report later about this. Meanwhile, my Fish Doctor anglers and I are really enjoying using Abu Garcia’s 7000i SYNCHRO line counter reel, fishing more efficiently with it, and catching more fish because of it! Ask Sal Furnare about the spring, 2011, brown trout fishing, and he’ll tell you it’s the best he’s ever seen. Sal boated a 20.3 lb. brown aboard the Fish Doctor on 5/6/11…, no wonder he’s psyched about the brown trout fishing. He’s not the only one. All but one of the Fish Doctor charters has limited out on a combination of predominantly browns, but also cohos, lake trout, and a few rainbows and Atlantics. On those trips, I have seen more 8 lb.and larger browns caught than we’ve boated since 1994. What brown trout fishing! First, the weather that we’ve had so far, with cool air temps and higher than normal rainfall, has produced the best spring brown trout fishing in the Oswego area that I’ve ever seen. It is so good that several charter captains from ports west of Oswego have temporarily moved their boats to Oswego. Lake water temperature outside Oswego Harbor is still in the low to mid 50’s…, optimum for browns. The plume of Oswego River water has extended slightly colored water for miles outside the harbor producing perfect fishing conditions and a situation where browns bite all day. Secondly, the weather forecast for the next 10 days thru May 25 calls for rain 8 out of 10 days, nightly air temps in the 50’s and highs no more than 70 degrees. The water temperature in the Oswego River has actually dropped from 61 to 59 degrees from May 14 to May 16, and the flow has increased slightly from about 20,000 cfs. to 20,400 cfs. Normal flow of the Oswego River at this date is around 7,000 cfs. This kind of weather and water conditions will extend this year’s fantastic spring brown trout fishing well into June. Third, with the abundance of alewives we’re seeing in shallow right now and the numbers increasing until peak spawn around June 15, browns are really putting on the feed bag, and I expect to see some real lunkers in the next few weeks. This beautifully colored brown hit a #44 Sutton on the afternoon of 5/13/11. 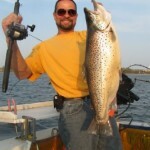 Lake Ontario Trout and Salmon Fishing…, Long Rigger Rods for Brown Trout…, Why? 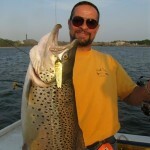 Steve Alex with a 14 pound brown he boated on a custom built 6-foot Fish Doctor Kidstick on the afternoon of 5/13/11. Step aboard the Fish Doctor at 4:45 AM, 15 minutes before I head out of Oswego Marina to fish for brown trout, and you’ll see 10 rods rigged and ready. Six of them are 9’ noodle rods built on 5-weight fly rod blanks that are used on my planer boards. The other four are 6 and 7 foot lightweight rigger rods, the 6-footers for the corner riggers and the 7-footer for the boom riggers. If I didn’t already have somewhere in the neighborhood of a dozen 9-foot noodle rods on hand, I’d be using 7-foot rods on the planer boards as well. Every rod is rigged with a Penn 855 digital line counter reel, 10 lb. main line, and 8 lb. Maxima Ultragreen leader. Step on most other charter boats during the spring brown trout season and you’ll see mostly 8 ½-foot or 9-foot rods all around. I’m often asked, including by other captains, why I use the short rods on the riggers. The answer is performance and efficiency. The short 6-foot rods, nicknamed “KidSticks” that I use on the stern riggers land fish just as well as the long rods. Question that, and I can show you a photo of a 23 lb. 8 oz. chinook salmon taken on one of them. Just two days ago, on an afternoon trip, Steve Alex boated a 14 pound brown on one, and we’ve taken many other 6-12 pound browns on them already this spring. Another benefit is easy rigging. I don’t care how long your arms are, you cannot hold a 9’ rod by the grip and reach out easily, without bending the rod, and grab the line in your hand to clamp it into a rigger release as you’re setting up. Even with my short arms, I can easily reach the line while holding the fore grip of a 6 or 7 Shortstick. Not only that, if I need to, I can swap ends with the rod inside the enclosed cabin of the boat. Not a bad thing when you’re rigging a leader, or whatever, on a rod in pouring rain and wind like we’ve been having almost every day lately. Another benefit is easy storage. The 6-foot and 7-foot rods store neatly in the rod racks on the ceiling of the cabin of my 28-foot Baha…, nice! If I need to store them downstairs in my cabin, I don’t have to fight the rod to get it thru the cabin door, and it stores neatly out of the way. Each to their own, but if you haven’t tried fishing shorter rigger rods, you might want to think about it. I use them throughout the season for browns and kings, along with 7-foot CopperSticks and Roller Dipsy rods. This year, I’ll be testing a 6’ CopperStick. We watched my 16” flat screen in amazement as not one, but four cohos darted around behind the red #00 dodger and green hummer fly trailing 5’ behind my underwater camera on the center rigger set 15’ below the surface. As all four fish swirled around in full view of the camera, a silvery torpedoe shot forward and nailed the fly, pulling the line from the downrigger release. The 7’ Shortstick sprang upward and a quick hand snatched the ultralight rod from the rod holder. Before the excited angler could say, “Fish on!”, the mint silver coho was already airborne. There are lots of brown trout being caught this spring in the Oswego area of Lake Ontario, but not many cohos, unless you’re fishing specifically for them. Sure, you’ll catch an occasional coho while fishing for browns, but the best locations and techniques for each differ. For those in the know who select for coho salmon in early spring they are a great bonus, especially when conditions aren’t right for browns. Nothing compares to their wild and wooly antics. Absolutely fearless of boats, and very surface oriented, I’ve seen them hit in full view, less than 6’ behind a down rigger weight and not more than one foot below the surface. The wilder and noisier the action of a lure and the gaudier the color, the more cohos like it. As they say, cohos like any colored lure as long as it has fluorescent red or orange in it. When you find a “wolf pack” of marauding spring cohos, prepare for action, because it’s not unusual for every single rod you have in the water to double over with a fish on it. Cohos are hyper fish. Everything they do is fast including the rate at which they grow. The cohos that make up Lake Ontario’s spring fishery are 2-year old fish that weigh 3-5 lbs. By late August of the same year, when they stage before returning to the hatchery in the headwaters of the Big Salmon river in northern Oswego Co., they will weigh 6-12 lbs. and more. After spawning, adult cohos die as do all Pacific salmon. One of the favorite rigs for spring cohos is a fluorescent red #00 dodger trailed 12” – 14” back by a small 1” – 2 ½” green mylar fly. Dodgers are effective trolled shallow on downriggers and Lite Bite Slide Divers(www.slidediver.com), but #00 dodgers and coho flies really shine fished behind inline planer boards like the Church TX-12 Mini Planer(www.churchtackle.com). To rig dodgers and flies for trolling behind inline planers, use 6’ of 20# test leader ahead of the dodger. Between the leader and the main line snap in a 5/8 to 7/8 ounce bead chain keel sinker. This weighted keel sinker helps keep the dodger from planing to the surface. Set the dodger/fly back 25 to70 feet behind the inline planer board, and let the planer board out to the side of the boat the desired distance. Multiple inline planers can be used off each side of the boat. High action jointed plugs like the J-9 orange and gold Rapala are favorites, along with standard size Michigan Stingers in hot colors, especially in a combination of fluorescent red and silver or brass. Riggers are normally set in the top 10 feet of water when surface temperatures are cold in late March, and April, then set deeper as temperatures warm and cohos move offshore. Much like landlocked salmon, cohos are attracted to the boat, and downrigger setbacks of 6 to 20 feet are common. My side riggers are set 3 to 5 feet down and 10 to 12 feet back with the dodger fly clearly visible from the boat as it wobbles back and forth. Diving planers are set on 15 to 25 feet of line. A trolling speed of 2.0 to 3.0 mph is about right depending on water temperature. 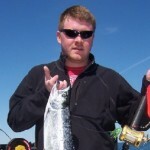 When a coho hits close to the boat, you usually see the fish in the air before you see the rod go!